From the moment you enter the lobby of the Grand Hotel you will appreciate its style which combines elegance, comfort and hospitality. 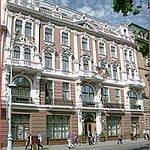 A masterful collection of paintings by Ukrainian artists awaits you in the halls of the hotel. 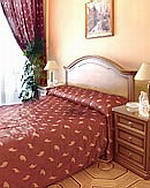 The Grand Hotel was stylishly renovated in 1992 to preserve the original facade, designed by famous architects E. Germatnik and L. Marconi and many unique architectural features of the rooms and restaurant. Each room is individually decorated to meet the needs of every guest. Complementary for hotel guests, within 5 minutes walk from the hotel, our fitness center provides everything you need for fun, sport, relaxation and beauty treatment. It features a swimming pool, jacuzzi, sauna, massage service, solarium, aerobics hall and gym.